I married my husband when I was 18. I was a sophomore in college and we lived in an apartment without a washer and dryer so my sweet mother asked me to “please drop your laundry off at the house so I can do it for you.” She claimed she wanted to save me money that could be used for food and time that could be used for studying but I suspect that she also thought Laundromats were seedy and dangerous places. It was also a great way of assuring her that I’d drop by to see her and Dad at least twice a week. I hope I thanked her often enough. She did all our laundry for the next three years, until I joined Jim at pilot training in Del Rio. My youngest son was just home for almost two months in-between an internship and his next semester at college. For six months he had been living in a questionable neighborhood in Newark, using Laundromats. His first load of laundry at the house was packed in so tight the clothes didn’t have a chance of getting clean. I believe that comes from trying to get as many clothes done as possible for the many quarters you have to plug into the machine for each load! Can’t blame him. As I pried the solid mass of half clean garments out of the washer I told him I’d be glad to do his laundry for him while he was home. He assured me that wasn’t necessary but he smiled. I can remember when laundry multiplied in copious amounts when I had three young sons at home. I can remember when it was hard to find time for it among the demands of carpooling and Little League games and wiping runny noses. I no longer have that approach to laundry. Now that Jim and I are empty nesters, I enjoy it. It reminds me that I live with people I love and that it’s a simple task I can do for them. I enjoy taking a smelly, wrinkled pile of fabric and making it wearable again. I love the smell of fabric softener. What was even more gratifying was how wonderfully thankful Alex was to have me doing his laundry. I now understand that when Mom was doing my laundry all those years it was her silent way of telling me she loved me and that she could still take care of me even though I had married and moved out of her home. The act of doing someone’s laundry is an act of love. Thanks Mom. Did I say that to you enough when you were alive? We are truly sisters! Oh, how I love the smell and feel of warm, clean clothes fresh out of the dryer, or right off the clothesline on a sunny day! It IS a sweet reminder to be thankful for those who wear the clothes. I have always used the time of folding or ironing to pray for that special one. (How happy and blessed was I to do a load of David’s when he was home for Christmas!!!) …and I don’t know how I would have survived the 70’s and 80’s without Mom’s help! So thanks again from me too, Mom! Once again, your blog makes me think differently about doing laundry for the girls. 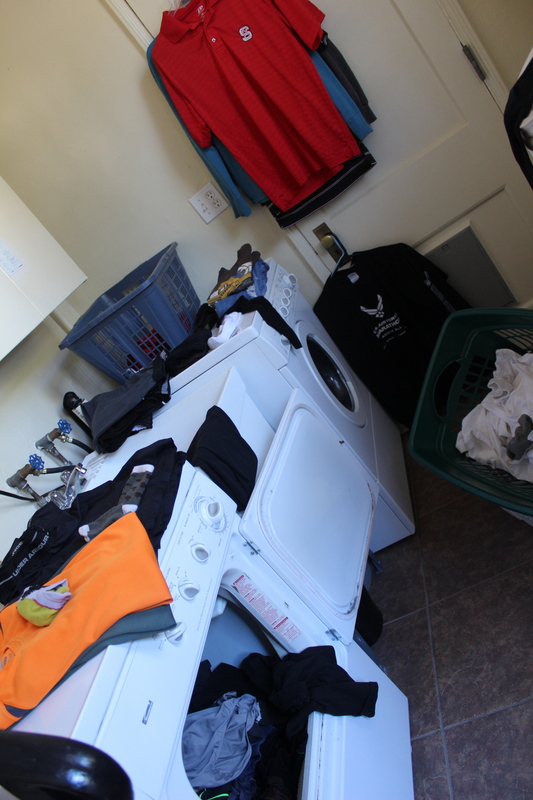 This year I had two girls bringing home dirty laundry – however, this year both girls helped with the laundry. Love how the responsibility of laundry makes me see how much the girls are ready to be on their own. I still need to work on Sarah – she still stuffs the washer full. Last year she burnt out the dryer ($375 repair). Love her and her laundry all the same. Keep the words of wisdom coming! Love you. Just reading this now and it is perfect timing with my son and two grandsons having moved in with us. I love doing their laundry. My son has a hard time trusting that it’s really OK because as a new single Dad, he wants to be able to do it all by himself. He thanks me constantly! For me, I remember how much relief it would have been if someone, ANYONE, would have helped me with laundry, or anything, while I was raising him by myself! Besides also loving that laundry smell, I like seeing how the boys are growing, appreciating new school clothes in new sizes, etc. Sometimes, it really is the little things but right now, for my son, everything seems huge! How wonderful that you can take care of him again in this way. Often we have to understand that it isn’t always the big gestures that mean something but that the small services we do for people every day is what brings grace into our lives, and into their lives! I love your thoughts… Always… Merry Christmas to you and The General! Thanks Hump! Merry Christmas to you also!